In today’s news, the Korea Herald reports that up to 70% of North Korean missiles are pointed at South Korea. 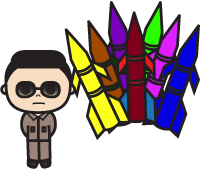 Click here for the 1000 Missile Story. This entry was posted in Series, Today's News and tagged 38th parallel, Communism, De-nuclearization, Democratic People's Republic of Korea, denuclearization, dictator, DMZ, East Sea, famine, international aid, Kim Jong-il, Kim Jong-un, Korean War, missile, Mount Geumgang, North Korea, North Korean, nuclear weapons, starvation, Unification, woman, Yellow Sea by easykorean. Bookmark the permalink.